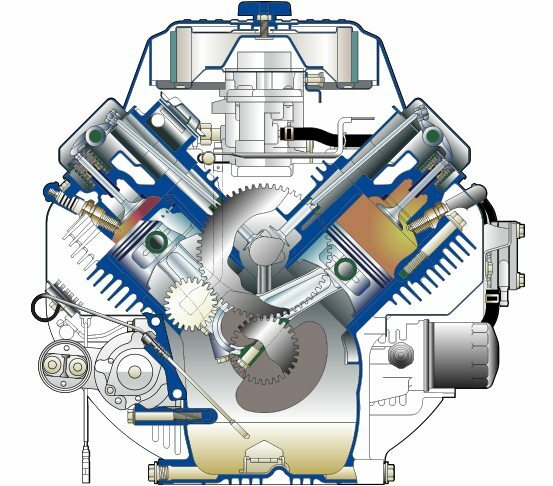 The Overhead Valve V-Twin Cylinder Series industrial engines are the workhorses of the Subaru commercial-grade engine line. These engines deliver smooth, reliable torque and low fuel consumption throughout the rpm range. The series provides maximum versatility in models with horizontal or vertical PTO shafts, which means you can use them with a greater variety of industrial and construction equipment. They’re also ideal for slightly larger equipment, such as lawn mowers, trenchers, ride-on trowels, concrete saws and vibratory rollers. The large main bearing support on the PTO side of the crankshaft minimizes shock under heavy loads. Aluminum alloy blocks with cast iron cylinder liners enhance reliability and extend engine life. The large-capacity air cleaner with dual elements protects the engine from dust and debris. A forged high-carbon steel crankshaft provides maximum reliability under demanding loads. An electronic low-oil-pressure system provides a warning to users to prevent damage to the engine. The full-pressure lubrication system uses a trochoid-type oil pump for efficient oiling.